Recently updated (2018) - stunning interior and view!! Tile floors - gourmet kitchen - Roku TVs - complimentary WiFi - this is your perfect "beach house". Emerald Isle is a 17-story luxury high rise on approx. five acres with 300' of beachfront directly on the Gulf of Mexico. This Gulf-front unit is located on the 14th floor. It has a private balcony and one whole wall of windows directly overlooking the swimming pools and white sandy beachfront of beautiful emerald blue waters! Living area has a pull out queen sofa bed plus 40' LCD/flatscreen TV, DVD player, CD player and access to balcony which can accommodate seating for six to eight. 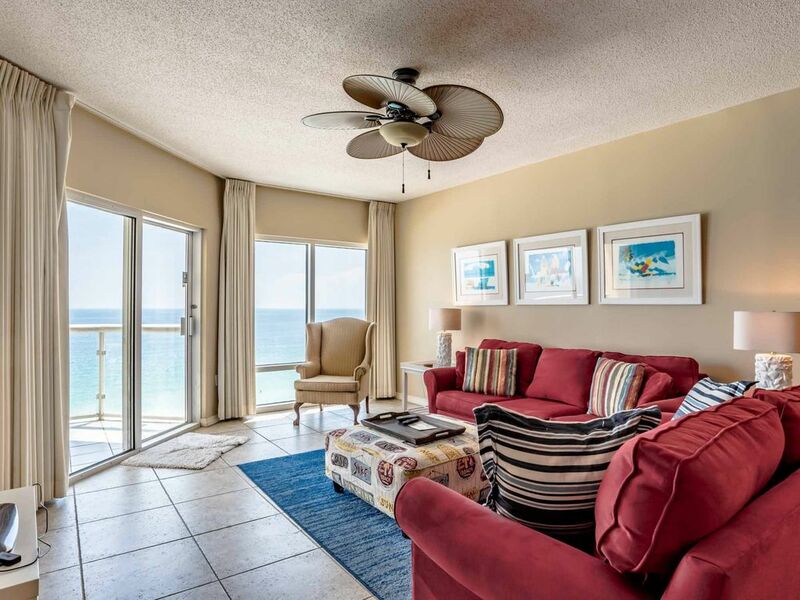 Master has a king bed with a 32' LCD/flatscreen TV and DVR, view of the Gulf and sliding doors onto the balcony. Master bath has combination shower/garden tub. Second bedroom has a queen bed with a 36" TV and VCR and a view of the Santa Rosa Sound water. There are two premium high rise twin air beds and one premium high rise queen air bed in the condo. All the air beds have built-in air pumps. Linens and towels are provided! Emerald Isle is THE only place to be on the island during Red, White & Blues week! The Blue Angels precision flight team take to the skies and perform right in front of Emerald Isle Wednesday, Thursday, Friday and Saturday! Enjoy the show from your private balcony....they fly at eye level! Elevator is conveniently outside the front door but not noisy! Parking lot is gated and secure, as well as electronic secure entry areas to the building. Very centrally located with walking to great restaurants and shopping! Additional activities just minutes away! Watch the Navy's Blue Angels fly over-head while sitting on the balcony! The Gulf Breeze Zoo just a short drive from Pensacola Beach. This zoo has more than 1,200 animals, including 30 acres of free roaming wildlife. There is also an opportunity to hand feed giraffes!! Another must see during your stay...the National Naval Aviation Museum, one of the world's largest aviation museums with more than 150 beautifully restored aircraft and IMAX theater. Must be 25 years old to rent. I live in Dallas, TX and have been coming to Pensacola Beach for 10 years. I have 2 boys who have "grown up" coming to the beach several times each year. It is our favorite place and we hope you learn to love it like we do. Beautiful beach, georgous condo, great family destination. Wonderful restaurants (get the grouper sandwich at Peg Leg Pete's, and the chowder or seafood nacho's at Flounder's) - great beach - wonderful sunrises and sunsets - lot's to do. Enjoyed our stay ! Clean and Safe !! The condo was very nice. Beautiful view. My family enjoyed staying there. The area is a great place to visit. I would definitely go back. It was Spring break so the pool was kind of crowded but other than that very nice. We loved our stay at your condo! The location is perfect! It’s right by the elevators and easy to get in and out of the building. Everything worked great and was just like the pictures. Will stay here again! The condo was beautiful and suited our needs completely. We very much enjoyed relaxing evening sitting on the deck listening to the gulf. This was the second or third time we’ve stayed in this unit and you cannot beat the views. The open floorplan makes for a lot of room, including the kitchen. Everything worked like it should. There are plenty of glasses, plates, and utensils. The side-by-side refrigerator may lack enough room for larger groups, but for the two of us it was plenty. The washer and dryer are great, and we used them several times. The views are fantastic from the master bedroom and the living room. There are sliding glass doors in both of those rooms. We enjoy the large tub in the MBR. The MBR mattress is a little firmer than I’m used to, but I slept fine on it. The pull-out tray in the night stands were very useful as well as the drawers built into the bed frame. There are plenty of towels, washcloths, and hand towels. There were at least two dishwashing detergent pods. There were plenty of luggage carts in the lobby. There are some places to eat breakfast, lunch, and dinner directly across the road. The bigger restaurants are about a half-a-mile up the road. I thought the LR TV picture was blurry for cable channels, but great on local channels. Beach access is very easy via the walkway. The beaches were clean and beautiful as always. This part may not apply to your stay, but the road that runs the length of the island (399) was closed between Pensacola Beach and Navarre Beach due to damage from Hurricane Michael. That was a disappointment for us, because we always enjoy the slow drive along that road, but it also meant having to use the toll bridge all the time. The one-dollar toll is not the issue, but we like to eat at some places in Navarre and taking that slow drive is one of the reasons. The loop/tower road was also closed in the Fort Pickens park for the same reason. You will figure this out when you get there, but expect to need laundry detergent, paper towels, trash bags, and possibly dishwashing detergent during your stay. We’ve stayed at other places in which some detergents were left from the previous renter, but there was no laundry detergent when we checked-in here. There were a couple of extra trash bags, but probably not enough to last a group of people for very long. Trash can be deposed of through a garbage shoot located at the east end of each floor. We love this condo. We’ve stayed in it before and will definitely do so again. Air Naval Station - Home of the Blue Angels with air shows regularly. Shelling on this beach is the BEST! !